Color and size: Different sizes can be produced according to your drawings and sample. The standard BAUSL Simmering combined with on internal buffer seal with a sine wave shaped sealing lip, as a one-part solution, for example for use in drive technology. A tried and tested design with high resistance to dust and material abrasion in the oil cavity. Our organization is known for offering supreme quality Buffer Seal to the esteemed customers. The entire range of products is highly demanded in the market for its effective usage in trolley wheels, vanes, buckets and rotor blades, seals, impellers, polyurethane bearings and other components. Moreover, we can check these products on certain well-defined parameters to gauge their flawlessness. 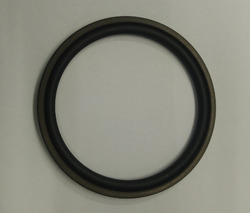 Rod seal profile RS063 consists of two piece seal set with one seal ring and one backup ring used as buffer seal before Royal RS027, RS036, RS045. A. B. Seals & Hydraulics Pvt. Ltd. NOTE: We cater queries from All over Delhi NCR i.e, Delhi, New Delhi, Noida, GreaterNoida, Kasna, Ghaziabad, Sahibabad, Gurgaon, Faridabad etc. - The primary purpose of the buffer seal is to protect the main rod seal from the effects of shock pressure loading. - It is important that the buffer seal allows adequate lubrication of the main seal and does not cause a pressure trap between itself and the main seal. 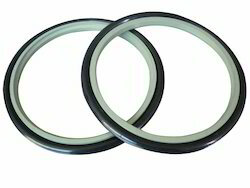 The Hallite designs of buffer seals have features that help to prevent this possibility.